5 Portraits of Octavia Hill born #OnThisDay in 1838. 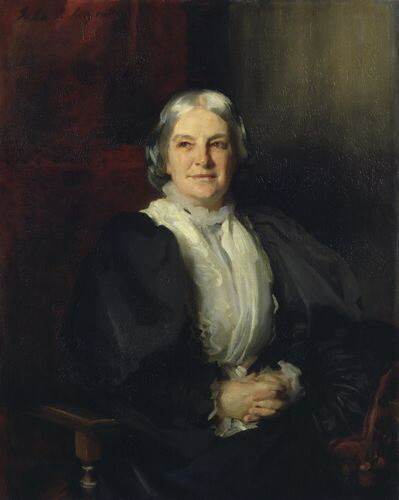 Octavia Hill was born in Wisbech, Cambridgeshire on 3rd December 1838.
the eighth daughter of James Hill, a prosperous corn merchant and former banker. Read more about Octavia’s early life here. Octavia, her mother and siblings re-located to Finchley, London. Read more about Octavia’s social influencers here. when she persuaded John Ruskin to buy three houses in Paradise Place in one of London’s most notorious slums. Octavia was to manage the houses with the intention of making “lives noble, homes happy and family life good”. Read more about Octavia’s plans here. In addition to her work in social housing, Octavia was also involved with local amenity societies, citizenship, the army cadet movement, conservation and the founding of the National Trust. Read more about the history of the National Trust here. Octavia Hill died from cancer on 13th August 1912. She was celebrated in her day, but after her death her reputation declined and she has been largely forgotten until recently. Octavia had a home on the edge of Crockham Hill Common in the Kent / Surrey borders. She’s remembered with this tomb near the altar of Holy Trinity Church. Read more about Octavia Hill’s connection to The Borough in Southwark, London here. And read more about English Heritage’s Blue Plaque at 2 Garbutt Place, Marylebone, London here. You might also like 5 websites about Ada Lovelace who died #OnThisDay in 1852. Previous Which flower do you like best for December? Next What’s happening to our National Health Service?